Whether you're headed on a solo journey, family vacation, or group trip, an itinerary can keep you organized and prepared for emergencies. Keep track of how you're getting from place to place, where you'll stay, and what you'll do all in one convenient document. 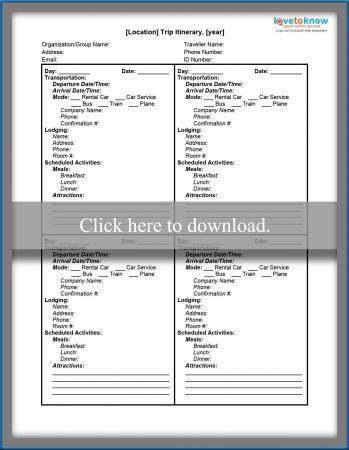 Click on the document image then download the free, printable itinerary. Add the details of your trip and print, and you're ready to take off. If you have any trouble using the printable, check out the Adobe guide for troubleshooting tips and tricks. All you really need to do is type or write the details of your trip, and the itinerary is good to go. However, if you want to get the most use of your trip planner, take a few extra steps before you go so you have more time for leisure while you're gone. Insert your destination and trip dates at the top of the page. If you're travelling in a group or on frequent business trips, this tiny detail helps keep everyone on the same page. The more information you can include, the more helpful the document is should your group get separated or you need medical attention. Use one section of the grid for each day of your trip by writing the day and date at the top. To make each section more distinct, use different color fonts or inks for each day. If you'll be using more than one mode of transportation in a day, number each type in the order you'll use them. Don't forget to add the contact information for companies you'll use to get around in case your phone dies and you need to call from the hotel or somewhere else. Confirmation numbers also come in handy in case of any disputes about reservations. If you've got a large group or are staying in multiple rooms, it can be really helpful to write everyone's room numbers. International travellers may find this section most useful as hotel names in different languages might be difficult to remember or several hotels might have similar names. Whether you schedule every second of every day or wing it, writing where you eat and sightsee gives you reminders when putting together a vacation scrapbook, photo album, or telling friends and family about your trip. Adding these details in pencils allows you an easy way to change your mind on a daily basis. Make your itinerary work for you by incorporating details specific to your trip or using creative means to stay organized for safe travel. For large groups or families, assign each smaller group or buddy pair a specific color and print their itinerary on that color paper or cardstock. Take the concept a step further and have groups keep their luggage tags and permission slips in the same color. Print multiple pages for longer trips so you have a section for each day from departure to arrival home. Use the meal sections for planning purposes by inserting two meal choices and asking each traveller to circle their pick on their sheet. Do the same with attractions and even transportation in some cases. If you own a B & B, have guests staying in your home, or have organized a themed trip like a destination wedding, leave blank itineraries in each guest's room so they can customize their trip. Make the most of your trip by planning everything in advance down to the smallest detail on a travel itinerary. Pack a copy in the bag you'll carry with you and give one to close friends or family members in case of an emergency.